A true one of a kind Colorado Experience in the foothills of Denver! Deer, elk, and wild turkey are just some of the wildlife you are apt to see while staying here. We take pride in providing experiences and amenities that are a rare find in a vacation rental. Enjoy your own private twenty yard lap pool where you can lap swim, play water volleyball, or simply lounge. A separate kiddie pool for our small guests and hot tub are just some of the features provided in this luxury retreat. Enjoy outdoor living and the many activities we offer on our lighted sports court which is a smaller version of a full size tennis court. Play tennis, pickleball, shuffleboard, basketball, and floor hockey. Games and equipment for the pool and sportscourt are provided. Enjoy our multilevel deck where you can eat, lounge, and converse while listening to the water fall feature as it cascades over the nearby rocks. This is operational during the summer months. You won't need to travel far to enjoy hiking and mountain biking. Less than one mile from the house are Mount Falcon and Pence Park. We are centrally located just seven miles from Evergreen, CO and Morrison, CO (home of Red Rocks Amphitheater), twenty-four miles from downtown Denver, and less than forty-five miles to Loveland Ski Resort. Four televisions throughout the house with premium channels and high speed internet. Stainless steel appliances including a washer and dryer. There is also a beverage cooler in the wet bar area of the swimming pool. We have a second refrigerator in the garage. Please note: We do have air conditioning which is a rare find with mountain properties! We are ideal for families, corporate retreats, and small group gatherings. We do not allow weddings, rehearsal dinners, bachelor / bachelorette parties or other formal gatherings at the property. Day guests unless pre approved in writing are strictly prohibited. We are a non-smoking property. Pets with the exception of service animals are not allowed. A violation of our rules will result in a full forfeiture of the deposit. When renting in winter months, we highly recommend a four wheel / all wheel drive vehicle! The driveway will be plowed when it snows between 6 - 8 inches but, you will encounter inclines, hills, and mountain terrain not only on our property but in the immediate vicinity. Your experience will be enhanced and you will have peace of mind if you rent the proper vehicle. Rental: The minimum age to book the property is thirty years old. We are firm on our pricing and minimum number of nights. Depending upon the season, the minimum night requirement ranges from three to six nights and pricing varies accordingly. * Total number of persons in your party. * Reason for stay, planned activities, etc. * The more information you can give us--- the better! property is a good fit! Cancellation Policy - Cancellations made prior to 90 days will receive a full refund. Cancellations made less than 90 days in advance will not receive a refund. The home was built in 1988 as a family retreat. A family of swimmers, Suzanne's parents built the home around the twenty yard lap pool, kiddie pool, and the indoor hot tub. Our family has had property in the area that dates back to the 1940's when Suzanne's father built a log cabin with his dad down the road from the current retreat. Family gatherings have been enjoyed for four generations in Indian Hills. As Suzanne's dad always said, "food just tastes better here!" This is the perfect location. The home is centrally located 7 miles between both Red Rocks Amphitheater and Evergreen, Colorado. We are located less than 60 miles to the closest ski area and only 23 miles to Downtown Denver. This home has all of the amenities for a perfect family vacation! An indoor pool, hot tub, kiddie pool, sports court, basketball court, shuffleboard, and large deck complete with a 30 foot water feature are all here and ready for your family to make your own memories! Total of three refrigerators. One in kitchen, one in garage, and beverage cooler in pool sitting area. Multi-level deck featuring three dining areas and multiple conversation / lounging areas. Cancellation Policy: 100% refund for cancellations more than 90 days before check-in date. This cancellation policy supersedes the cancellation policy on the Homeaway/VRBO/Vacation Rentals websites. Larry and Suzanne were very professional and helpful in every aspect. 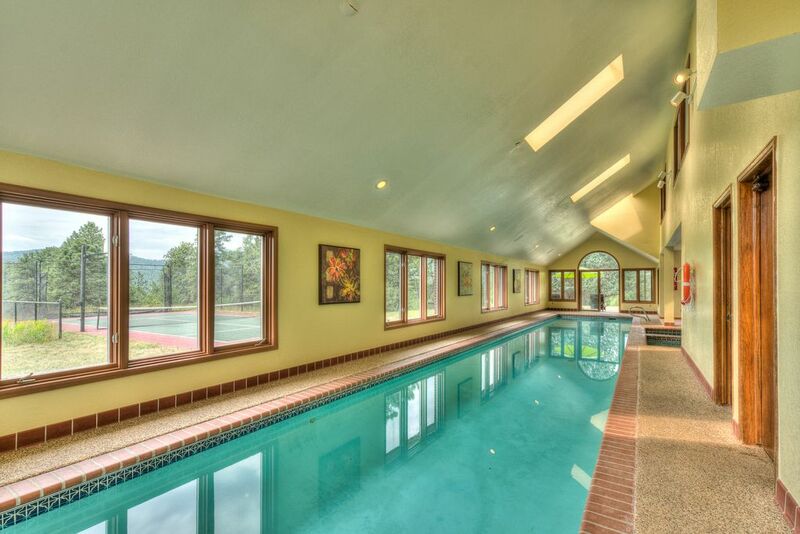 The property is amazing from a fully stocked kitchen to the awesome indoor swimming pool and hot tub. The property surrounding the house was full of life and very well maintained, we even enjoyed a some tennis and basketball during our short stay. We will most definitely be coming back! Thank you! Thank you! This house was amazing and Larry, the owner, was most helpful upon our arrival. We will definitely come back! Larry and Suzanne were so accommodating and made everything very easy. My group loved the house and the property is simply stunning. Would definitely rent again! Annual men’s trip and 35th birthday celebration was a blast and the house accommodated the group perfectly. Larry was very helpful and surrounding hiking was great! Great property! Our family had the best time with so many activities at our finger tips! Great for a large family like ours. Extra charges will apply if maximum number of guests is exceeded. Please contact owner for details. Minimum age requirement of 30 years old to rent property.